Describes a participant in a MUC room. Definition at line 32 of file mucroomhandler.h. 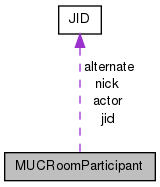 If the presence change is the result of an action of a room member, a pointer to the actor's JID is stored here, if the actor chose to disclose his or her identity. Examples: Kicking and banning. 0 if the identity is not disclosed. Definition at line 54 of file mucroomhandler.h. The participant's affiliation with the room. Definition at line 40 of file mucroomhandler.h. If flags contains UserRoomDestroyed, and if the user who destroyed the room specified an alternate room, this member holds a pointer to the alternate room's JID, else it is 0. Definition at line 71 of file mucroomhandler.h. Definition at line 46 of file mucroomhandler.h. Pointer to the occupant's full JID in a non-anonymous room or in a semi-anonymous room if the user (of gloox) has a role of moderator. 0 if the MUC service doesn't provide the JID. Definition at line 42 of file mucroomhandler.h. In case of a nickname change, this holds the new nick, while the nick member holds the old room nick (in JID form). newNick is only set if flags contains UserNickChanged. If flags contains UserSelf as well, a foregoing nick change request (using MUCRoom::setNick()) can be considered acknowledged. In any case the user's presence sent with the nick change acknowledgement is of type unavailable. Another presence of type available (or whatever the user's presence was at the time of the nick change request) will follow (not necessarily immediately) coming from the user's new nickname. Empty if there is no nick change in progress. Definition at line 59 of file mucroomhandler.h. Pointer to a JID holding the participant's full JID in the form room@service/nick. The MUC server may change the chosen nickname. If the self member of this struct is true, one should check the resource of this member if the actual nickname is important. Definition at line 34 of file mucroomhandler.h. If the presence change is the result of an action where the actor can provide a reason for the action, this reason is stored here. Examples: Kicking, banning, leaving the room. Definition at line 51 of file mucroomhandler.h. The participant's role with the room. Definition at line 41 of file mucroomhandler.h. If the presence packet contained a status message, it is stored here. Definition at line 69 of file mucroomhandler.h.